The two phones are almost similar in terms of camera setup, screen resolution and battery capacity. Both the phones run on Android 8.0 Oreo. 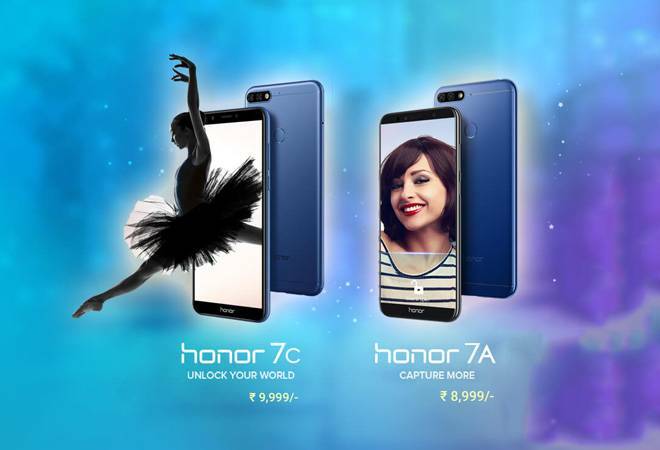 Huawei has launched its two new 7 series smartphones Honor 7A and Honor 7C in India. The smartphones which were launched in China in April and March respectively will be available in India for below Rs 10,000. The two phones are almost similar in terms of camera setup, screen resolution and battery capacity. Both the phones run on Android 8.0 Oreo. The two phones have some interesting features like Huawei Histen's 3D sound effects, a Ride Mode and a Party Mode which lets users connect many phones to produce a single audio output. The Honor 7A will start at a price of Rs 8,999 and will go on sale on Flipkart on May 29 from 12pm onwards. The 7C will start at Rs 9,999 for the 3GB RAM 32GB storage and for the 4GB RAM 64GB ROM it will go up to Rs 11,999. The Honor 7C will go on sale on Amazon from 12pm on May 31. The phones are available on the HiHonor online store and will come in Black, Blue and Gold coloured variants. Reliance Jio is offering Rs 2,200 cashback with 50GB extra free data for Honor 7A. The Honor will get 100GB of free data. Both 7A and 7C come with dual-SIM (Nano)and run on Android 8.0 Oreo based EMUI 8.0. The 7A has a 5.7-inch full HD+ (720 x1440 pixels) IPS LCD display with an aspect ratio of 18:9. The Honor 7C comes with a 5.99-inch full HD+ (720 x 1440 pixels) IPS LCD display with 18:9 aspect ratio. While the 7A is powered by an octa-core Qualcomm Snapdragon 430 SoC paired with 3GB RAM, the 7C is powered by an octa-core Qualcomm Snapdragon 450 SoC coupled with 3GB or 4GB RAM. The 7A will feature only one variant in India - the 3GB RAM variant which has a dual rear camera setup with a primary 13-megapixel sensor and a secondary 2-megapixel sensor. It sports an 8-megapixel camera with f/2.2 aperture and a soft selfie light in the front. The Honor 7A comes with 32GB storage expandable up to 256GB via microSD card. Connectivity features of the phone include 4G VoLTE, Wi-Fi 802.11 b/g/n with hotspot, Bluetooth v4.2, GPS/ A-GPS, Micro USB and a 3.55mm headphone jack. The phone also has sensors like accelerometer, ambient light sensor and proximity sensor. The 7A weighs about 150 grams and measures 152.4 x 73 x 7.8 mm. A 3000mAh battery powers the phone. The Honor 7C has a dual rear camera setup similar to the 7A and also hasthe same front camera specifications. The only difference is the aperture which is f/2.0. The 7C has 32GB or 64GB inbuilt storage which are expandable via microSD (up to 256GB). Connectivity features and sensors of the 7C are also same as the 7A. It features a fingerprint sensor on the rear panel and the phone also has a Face Unlock feature. The 7C has a 3000mAh battery and measures 158.3 x 76.7 x 7.8 mm. It weighs 164 grams. The Honor 7A and Honor 7C will compete with the Xiaomi Redmi Note 5 and Redmi 5 series.